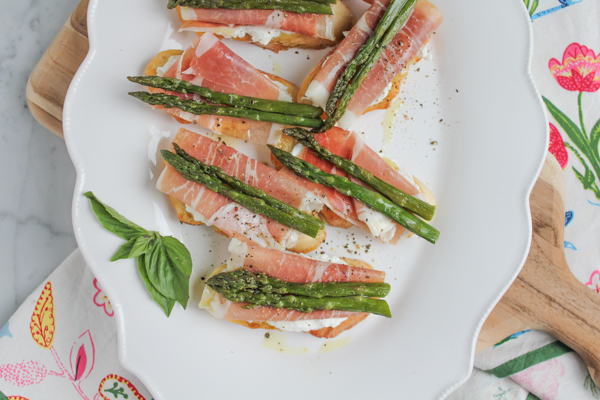 Roasted Asparagus Prosciutto Crostini + A Video! 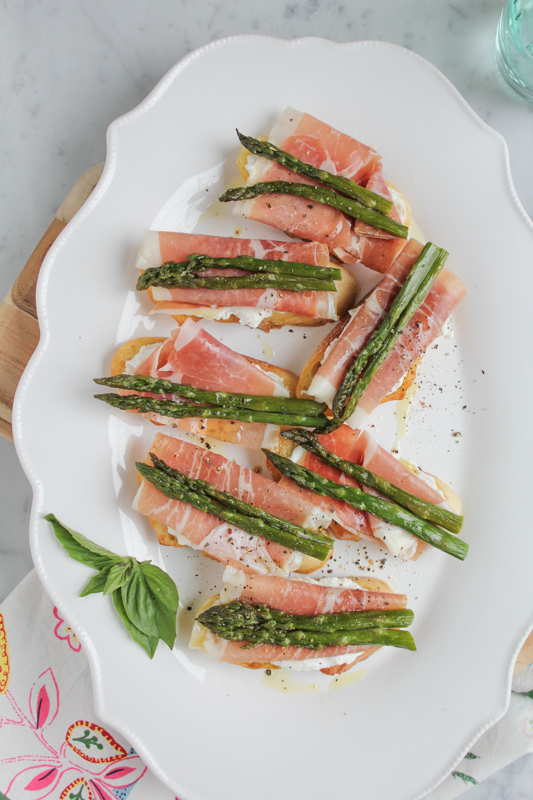 Rich, creamy fresh ricotta cheese spread on toasted bread, topped with prosciutto and roasted asparagus. 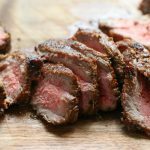 So EASY and makes an absolutely delicious appetizer! I can’t believe the month of April is almost over. Soon it will be May and then the summer. I can’t get over how fast this year is going by. I have some exciting things planned for the summer. . here, in Madison, and I will try to get back home to Dallas to see my parents. Now that I don’t live close to my family, I always get a little sad around holidays. Especially with Mother’s Day coming up. . for those of you who live close to your parents and family, I hope it’s awesome and great! My dad would always say to us growing up, “Family is the most important thing. So take care of each other.” I find myself saying the same thing to my daughters . . next year they will be at the same school together and riding the bus together etc. So, I want to make sure they watch out for each other. The other day I was at the grocery store and I grabbed some more asparagus. 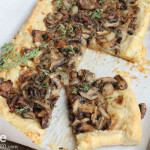 You would think I would be sick of it now, after making this tart like 5 times within the last two weeks. 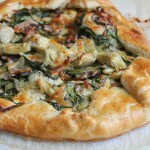 And, I know, I know, you’re probably like . . another recipe using asparagus? Really? 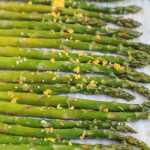 I just can’t get enough asparagus these days and will happily be chomping away on asparagus until the season is over. Anyone else with me??? 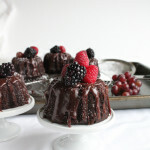 Mother’s Day is Sunday, May 8th and this would be the perfect appetizer to make! I’ll show you just how easy it is! 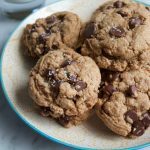 I hope you give this simple and delicious recipe a try! Makes about 18-20 crostini. *Additionally, if you want more of a kick, you can rub or spread a little roasted garlic on the toasted bread slices before spreading on the ricotta cheese, or you can use extra virgin olive oil with garlic like I did. While the asparagus in the oven, heat the remaining tablespoon of extra virgin olive oil, in a large non-stick pan over medium-high heat. After a minute, place the baguette slices into the pan and cook on each side until slightly browned and crispy, about 2-3 minutes on each side. Repeat until all of the baguette slices are toasted and feel free to use more olive oil as needed*. Alternatively, you can toast the baguette slices in your toaster oven (as I did in the video). To assemble: generously spread on the fresh ricotta cheese on each toasted bread slice, top with a slice of prosciutto and then the roasted asparagus. Drizzle with a touch more extra virgin olive oil and season with freshly cracked pepper if desired. Enjoy immediately! Crostini are the best, these look incredible! Asparagus is the best. so keep posting it! Hope you get to see your family soon. It’s tough being a distance from home, but now they can just watch your videos and feel like you’re right there with them. 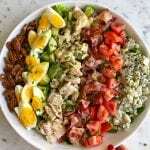 With this amazing appetizer! I am a little asparagus obsessed at the moment and I am definitely making the most of asparagus season. These look like they would be great to serve at a party. I love your video, Alice! And I love asparagus, too. It’s my favorite veggie! 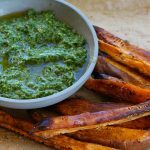 This looks like such a delicious appetizer for spring! No such thing as too much asparagus! Great video, Alice! And I love this crostini! I absolutely love asparagus and prosciutto. Now, I’m totally craving it! 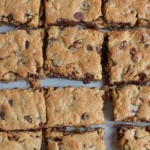 I know the first thing I’m going to make when I pick some up today – this recipe. Pinning for later and going to enjoy some asparagus this weekend with a glass of vino 🙂 Have a lovely weekend! You are so fun to watch, Alice!! This crostini would be a huge hit around my house. 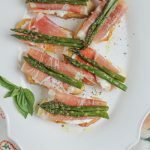 We love asparagus and prosciutto!! I’m with you on the asparagus love, Alice! I say keep it coming, girlfriend! This crostini looks delicious! 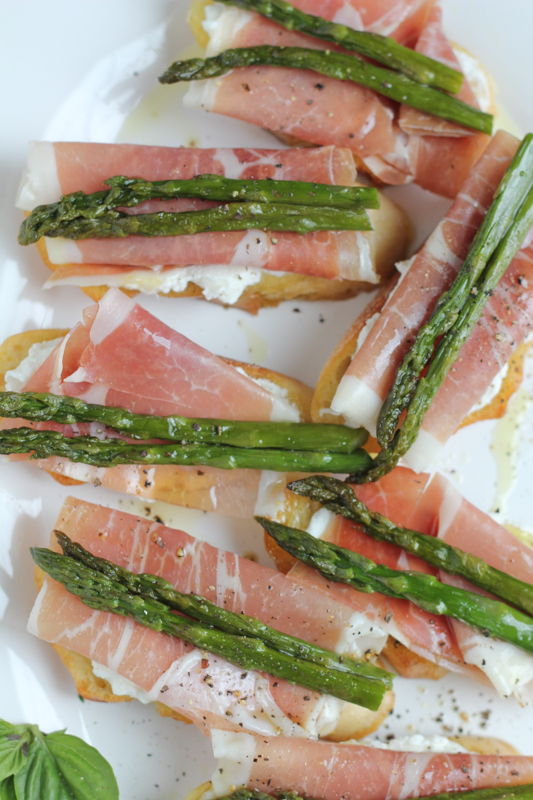 Prosciutto and asparagus totally belong together. I could most definitely eat just these crostini for dinner! I love all you videos and you totally rocked the Today show, girlfriend! You are a rock star! P.s I don’t live near my mother either, so I feel you! but I’m glad you are going to make time this summer to visit home! Cheers, dear! I love how simple yet elegant this is, Alice! 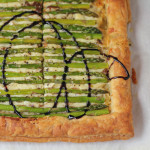 When spring hits, I seriously can’t get enough asparagus! I could literally eat prosciutto by the pound, and I never met a crostini I didn’t like. For me, this gorgeous app has it all! 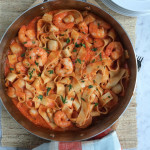 In fact, I could have this as dinner and be very, very happy! Keep the asparagus recipes coming, Alice! I love the combination of roasted asparagus, creamy ricotta, and crunchy baguette! Totally sympathize with you over living far from family – it is so, so hard sometimes. But on a happy note, this appetizer looks and sounds amazing. The best ingredients! I love asparagus and just can’t get enough. I’ve yet to convert Justin and elliott but just means more for me. Another great video Alice!! I am an asparagus fanatic at this time of year. 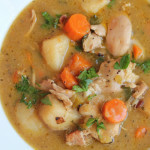 Love this recipe and great video!